I love this delicious Asian Noodle Salad. It’s based on a Central Asian recipe that I make with chicken and shrimp. Traditionally made only with chicken or beef, the shrimp is a delicious addition. You’ve never tasted anything like this salad before. 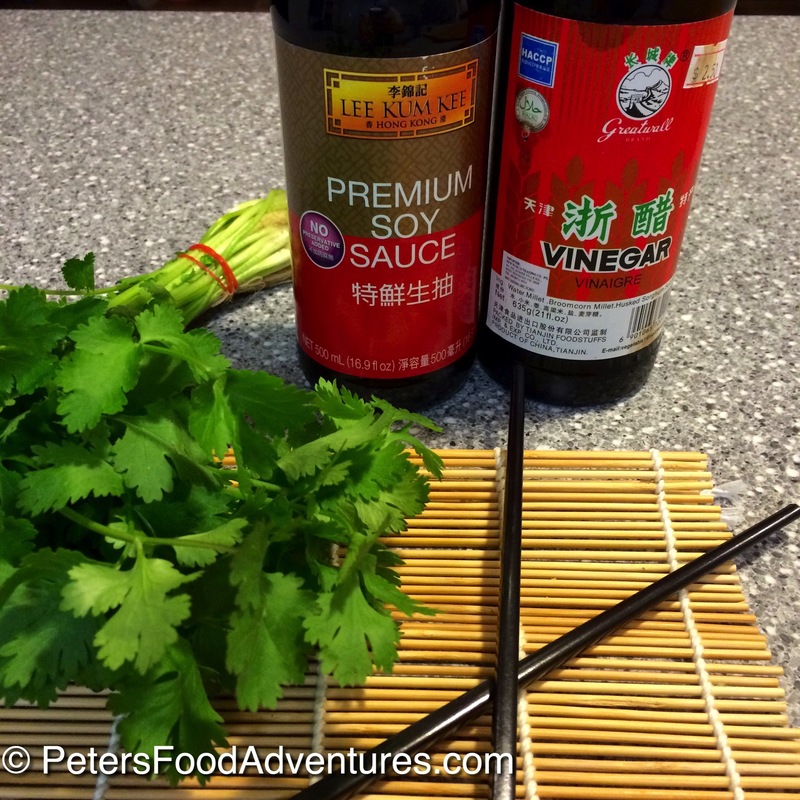 I love using Chinese Black Vinegar in this recipe. This Central Asian Noodle Salad is usually made in large quantities for celebrations of special events. I don’t remember a single family gathering, church event, or a party without versions of this Asian Noodle Salad. This is something that many people may not have heard of, a hot salad. But yes, they do exist. Not all salads are leafy green lettuce recipes. Although that is what they are defined as in English, it’s not always the case (think of a potato salad). This Asian Noodle Salad can both be eaten hot or cold. If you prefer it cold, just refrigerate it before serving. It’s a healthy salad, but it can be eaten like a meal. There are many variations of this dish, with different vegetables, spices and meats. Prawns and Shrimp are interchangeable, depending on the country you are reading this from. Use what you have readily available. 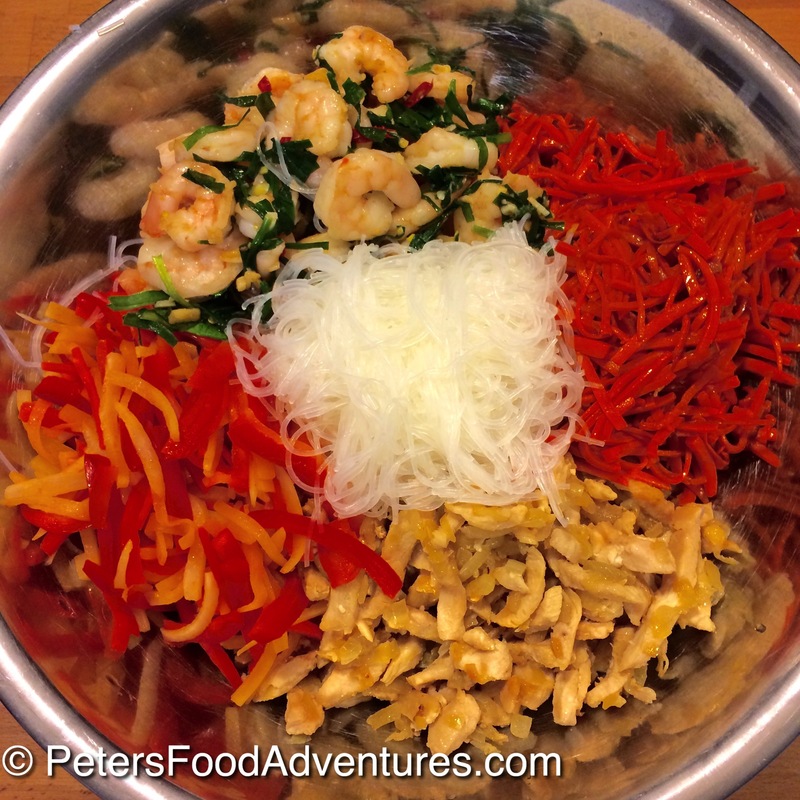 My Asian Noodle Salad seafood variation of Funchoza Salad from Northwestern China. It’s not a Chinese recipe, but a Central Asian dish. This is a perfect recipe for a hot Australian summer’s day. Chicken and Shrimp work together perfectly in this salad. I love the freshness the cilantro and the shrimp add to this Asian Noodle Salad, with a hint of black Chinese vinegar. I have a spicy sesame oil which I add at the very end for a spicy kick, but you can use regular sesame oil. Garlic chives (джусай) are an under rated herb. As a child, none of my friends knew what garlic chives were, it definitely wasn’t easily available at the grocery stores at the time. You can find them at local farmer’s markets or sometimes in Chinese grocers. If you don’t have garlic chives, just chop some regular green onions. Don’t skip the garlic chives in this Asian Noodle Salad. Not only does it add a nice visual contrast to the dish, but most importantly it adds great flavor. Remember to always leave the Black Chinese Vinegar on the table, so your guests can add more to their plates when they eat. Bon Appetit! Приятного аппетита! This Asian Noodle Salad comes from Central Asia. It's a colorful salad, deliciously served cold or warm. Made with chicken, shrimp, bean vermicelli, cilantro, red peppers and shrimp, a perfect combination! Heat a large frying pan with 2 tablespoons of oil on high heat and cook the onions until they become translucent - approx. 5 minutes. Add the chicken and cook together until the chicken is browned and the onions are caramelised, on medium high heat. There will be a point where the juices from the onions and chicken will make the frying pan quite juicy, but continue frying until the onions caramelise. (8-10 minutes) Set aside the cooked onions and chicken. Heat the same frying pan with 2 tablespoons of oil and 1 teaspoon of sesame oil on high heat and add julienned carrots. Fry on medium high heat for 8-10 minutes until carrots are soft and caramelising. Set aside. Prepare the Bean Vermicelli according to package directions. Cut noodles using kitchen shears into 6" pieces. Drain from the water and put inside a large mixing bowl. 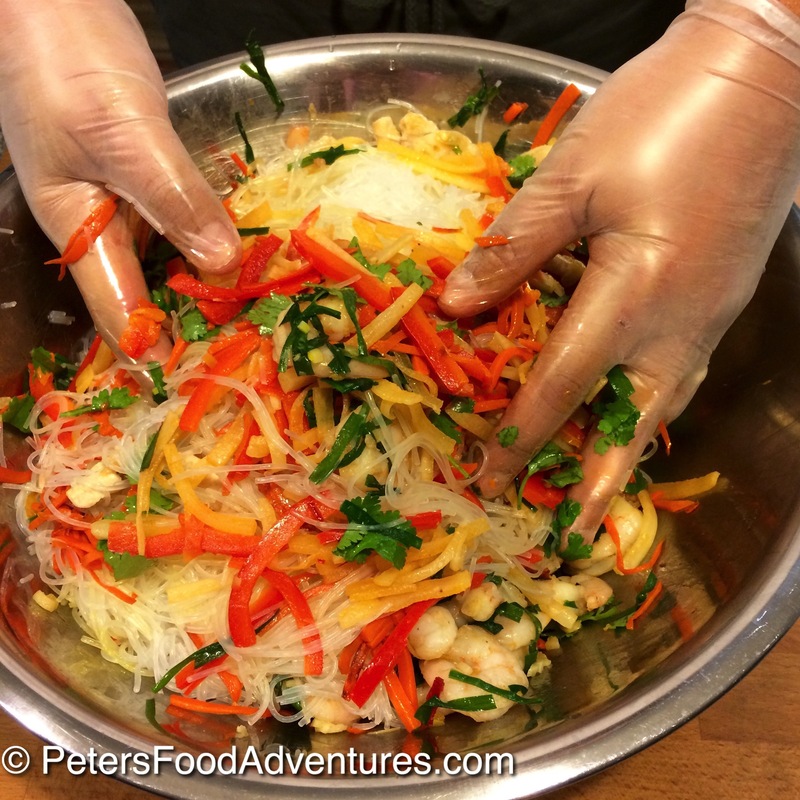 Add the chicken, onion, carrots, daikon, red peppers, shrimp, cilantro, chilli, garlic chives into the large mixing bowl of vermicelli and mix thoroughly. Wear disposable kitchen gloves to mix, as it's quite oil and messy. 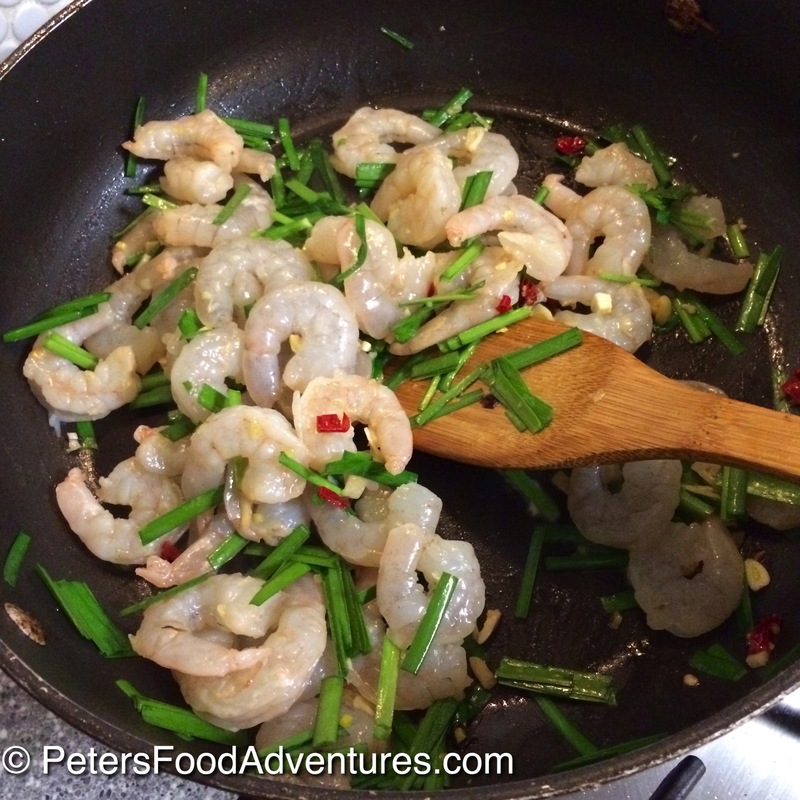 Add the soy sauce and Chinese vinegar and sesame oil to taste. I add extra black vinegar because I love the tangy taste. Be sure to add vinegar and taste in small amounts. The ratio of soy to vinegar is 3:1. Be careful not to over vinegar. If unsure, go with less black vinegar and leave on the serving table for people to add as they like. Nice! I love funchoza but have never tried it with prawns before. Just made it, my daughter rated this 10 out of 10. Really good! Turns out chicken and prawns are a fantastic combo! I substituted the garlic chives for green onion and 2 cloves of crushed garlic, omitted the daikon. I did take your word of advice and slowly added vinegar 1 tsp at a time, mix and taste. Using the big steel bowl is definitely the way to go. Fantastic meal for my guests! Thank you! Thanks! My Chicken and Prawn Asian Noodle Salad is a hit with my kids too. Great substitution for the garlic chives. You definitely want to go slow on the vinegar, too much will ruin the dish! Glad you and your kids enjoyed it!